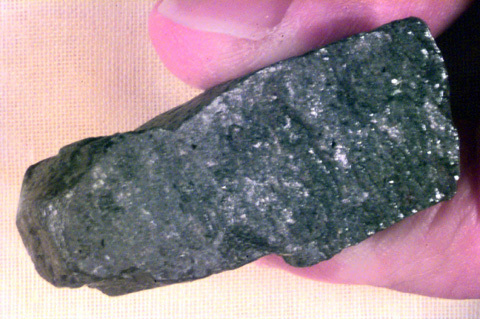 A ferro-magnesian mineral. Dark green to black, although weathered specimens may look faded. Dull luster; blocky appearance; 90 degree cleavage, although it is typically hard to find or see. This is a common mineral in mafic igneous rocks usually mixed with Ca Plagioclase. We often want to confuse pyroxene with amphibole because they are both mafic minerals found in mafic igneous rocks but the amphibole is shiny black and shows abundant parallel cleavages.